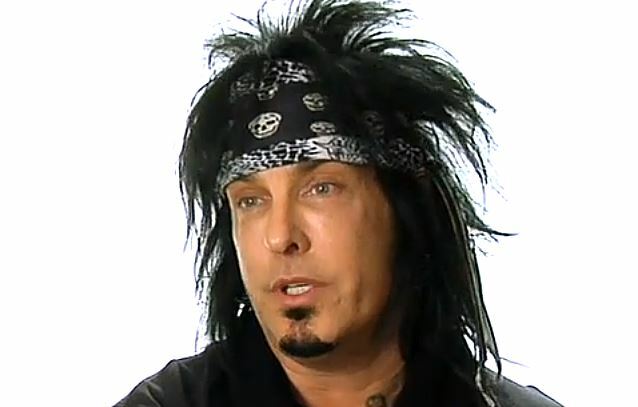 MÖTLEY CRÜE bassist Nikki Sixx has commented on the growing trend by music consumers of purchasing and downloading individual songs through digital outlets rather than experiencing full-length albums as they were intended to be heard by the artists that created them. In a post on his Facebook page, Sixx wrote: "When I was scrounging through record shops as a kid, you usually (unless you just shopped for singles) bought the whole album. I always fell deeper in love with the band because 'ALL' their songs spoke to me. Of course, some jumped out at you right away while others grew on you, but you didn't skip any songs; you would listen from top to bottom over and over again. "When I started making albums, I always believed the WHOLE album was the adventure. Of course, there is the lead single for radio but when did THAT become the whole experience? "I talk to more and more people every day who tell me they only buy singles now. iTunes hasn't helped for that, of course. "We have asked them many times to bundle our album as one download so fans wouldn't cherry pick the hits and miss the hidden gems, but it's not part of their business model. "I love iTunes and buy music almost daily from it, but it still frustrates me. I just wish more people clicked 'BUY ALBUM.' Maybe I am old-fashioned in how I believe music should be listened to, but I refuse to ever buy just a band's single. I always buy the WHOLE album. I encourage you to do the same. "Technology may have changed, but the fact that a band makes a WHOLE album for you hasn't. Dig deep and I promise you, you will fall deeper in love with the artist than you ever could only listening to one song." In a 2011 interview with RollingStone.com, MÖTLEY CRÜE drummer Tommy Lee spoke about not wanting to make albums anymore. He said: "As far as making new music, I'm sure we will. There's nothing official laid out yet. What I meant was just making records to make records doesn't seem like that's got much of a point anymore, when people don't buy records, they buy singles. Why not make more singles more often than these big, long records over two-, three-, four-year spans? Give the fans more music and better music, like doing EPs. I just think that would be a way better thing. Now, making a full-length record, I think, serves a purpose, like, let's say, when [MÖTLEY CRÜE's] 'The Dirt' [movie] finally gets made. I'd say that totally warrants a full record and soundtrack album. But just to make long-playing records now, I don't know. I've lost my appetite for it, and if you look around at the facts, so has the rest of the world."